There’s a fine art to the charity auction. Pairing a good cause with worthy goods and suitably talented contributors is no easy feat. Yet War Child USA appears to have pulled it off. Sterling Ruby, Iggy Pop, Michael Stipe, Gus van Sant, Shepard Fairey, ex-Cure guitarist Pearl (formerly Porl) Thompson, Muse frontman Mat Bellamy, the artist Ginger Gilmour (ex-wife of Pink Floyd’s Roger), Canadian painter Michael Adamson, and British artist and filmmaker Sam Taylor-Johnson have all reworked an instrument. 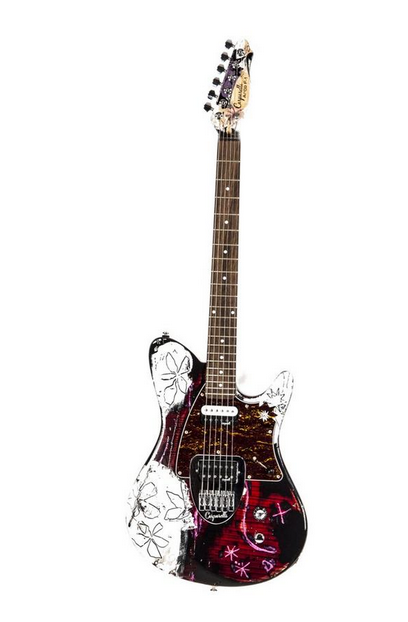 via Chain Of Flowers: Pearl painted guitar in Warchild auction.